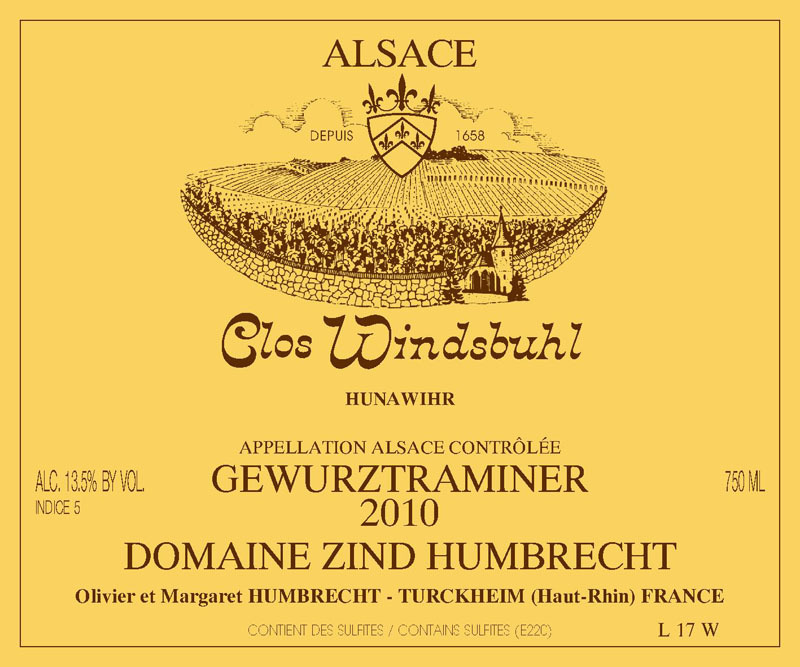 The Clos Windsbuhl is a historical Clos located at the top of the village of Hunawihr on an old calcareous rocky soil from the Jurassic period. First mention in history dates back to 1324 when the Windsbuhl becomes property of the Habsbourg of Austria. At this time it was also a hunting lodge! This Clos enjoys a late ripening climate that produces elegant and racy wines. Gewurztraminer was probably a real challenge at the time of plantation (60’s and 70’s) but the light rocky soil of the Windsbuhl is capable to do wonder. The flowering started just at the end of the cold period in 2010, but the yields were still extremely low. Like most recent vintages of Clos Windsbuhl, the grapes were harvested at a high level of ripeness, good acidity and the fermentation stopped with a lot of residual sugar. 3/2012: there are already lots of fruity and exotic aromas at first, but then quickly, as the wine is opening up, more complex spicy flavours develop on the nose. There is a sense of richness and sweetness on the nose, probably enhanced by the presence of crystallised fruit aromas. The palate is unctuous and round, really close to a late harvest in style. The important sweetness is well into balance and the finish leaves a nice impression of harmony. Falsely ready today, this wine will need lots of extra ageing time.